Icarus Films: Devils Don't Dream! Arbenz had led the successful 1944 revolt against the military dictatorship, a regime that had oppressed Guatemala since colonialism. Arbenz, the son of Swiss immigrants, was celebrated as a national hero. 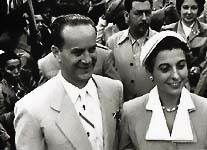 Elected President in 1950, Arbenz was not a member of any party - he didn't issue any manifestos. But he began to fulfill his promises - farmers got their own land. "The first act of justice since colonial times," said Arbenz. In the early 1950s, with the Cold War intensifying, then Vice President Richard Nixon said, "Arbenz is not a Guatemalan President." Nixon called him "a foreigner, manipulated by foreign powers." The young President of Guatemala was soon overthrown, declared a traitor, and chased out of the country. "Andreas Hoessli captures the essence of a country, Guatemala, that has had its heart torn asunder and its soul obliterated. He has related the story of a harrowing tragedy that is, at its core, about bananas, but whose consequences defy the imagination … His sensitive portrait of the Guatemalan national reform leader, Jacobo Arbenz, is an extraordinary work of art. And yet, through the magic alchemy of film, he has turned one of the most tawdry and shameful episodes in American foreign policy into an extraordinary tribute to the endurance of Guatemala." - Stephen Schlesinger, Director, World Policy Institute, and author of "Bitter Fruit"
Since 1999 more than two thousand women have been murdered in Guatemala. Yet law enforcement and government turn a blind eye.